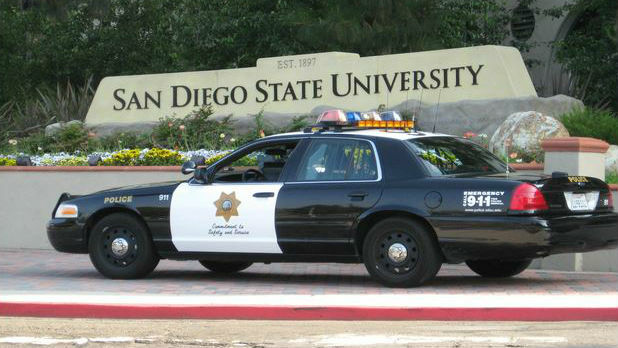 A thief armed with a pistol robbed an 18-year-old San Diego State University student near the southern outskirts of the college campus early Thursday. The victim was walking in the 5500 block of Montezuma Road when the robber confronted him about 12:45 a.m., according to SDSU police. After stealing the student’s wallet, the bandit fled to a waiting white Toyota Prius and was driven out of the area by an accomplice. No injuries or gunfire were reported. The robber was described as a thin, roughly 5-foot-10-inch black man in his late teens or early 20s, wearing black pants and a white shirt. No description of the getaway driver was available. Investigators were reviewing surveillance-camera images of the crime, according to the campus police department.